This section is from the book "Guide For Nut Cookery", by Almeda Lambert. Also available from Amazon: Guide to nut cookery. Chufa is a grass-like plant, indigenous to the countries bordering on the Mediterranean Sea, and cultivated for its nut-like, sweet tubers, called Chufa or Earth Almonds. 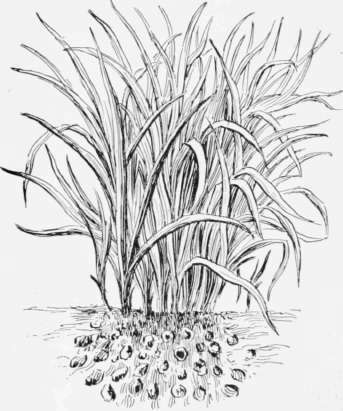 It belongs to the Sedge family (Cyperacene), and botanically is called Cyperus Escutentus. The leaves resemble coarse marsh grass. The plant produces small, oblong tubers in abundance, which are rich in fats and very sweet, tasting like the almond, but having a better flavor. An excellent milk may be made from them, which can be used for shortening. They can be easily grown, by planting them in drills like peas. Seed Chufa can be obtained at Buckbee's seed store, Rockford, 111. These nuts generally go by the name of Chufus, or Earth Almonds.